AMHE Foundation - Promoting Health, Education, and Welfare in Haiti. 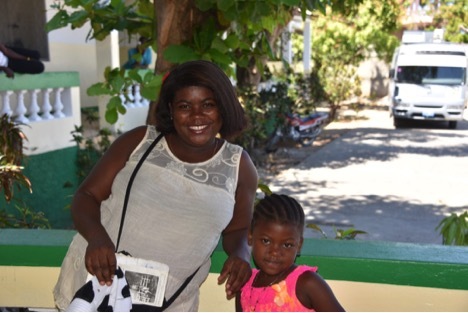 Promoting Health, Education, and Welfare in Haiti. The AMHE Relief Mission went to the south Peninsula of Haiti, particularly the town of Jeremie, on Saturday February 25th, 2017. 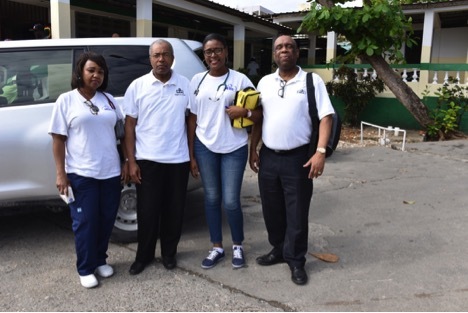 The group included Dr. Paul Nacier, Dr. Eric Jerome, Dr. Yvane Drouillard , Nurse Marie Jean-Baptiste and Mr. Lionel Badio . On Sunday the 26th of February, at 9:00 the group started working at the Hospital. The plant that was severely hit by the Hurricane Matthew with 140 mph winds, lost its top floor and suffered broken windows but the different services including medicine, surgery, pediatrics, OBG/YN were preserved but still damaged. 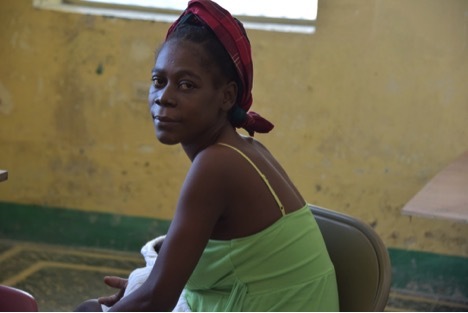 Outpatient clinics were also affected by the Hurricane; they were left without roof that was later on replaced. After making rounds in the different services, the group stayed at the emergency department until late in the afternoon. We saw many cases of Hypertension, Cerebral Vascular Accidents, Congestive Heart Failure, Asthma, Typhoid fever, Urinary Tract Infection, Lacerations, Fractures, Malnutrition cases, battered women and many more. Free medications were given out to the people. After a very hard day we went back to the hotel to recover. The following day, we started at 9:00am, we diagnosed other cases of Malaria, Dehydration, Malnutrition and Diarrhea in children. Other patients with Congestive Heart Failure secondary to peripartum Cardiomyopathy were treated with Furosemide and Ace Inhibitors. We received multiple fractures secondary to motorcycle accidents. Unfortunately, Orthopedics was not immediately available. The next day, we received a case of intestinal obstruction with perforation secondary typhoid fever. We called a surgeon for consultation and one operation was performed. We took the opportunity of evaluating the hospital needs, infrastructure problems. To really deserve the title of Departmental Hospital for reference, improvement has to occur. We salute the work of Ms Conception Pamphile as a dynamic administrator and the dedication of Dr Ronsard Presidio. 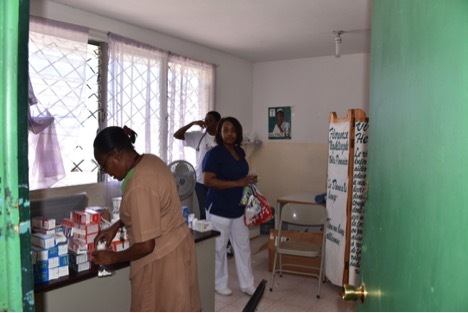 On Wednesday March 1st, a few members went to work at the Outpatient Clinic. We inspected the Laboratory, electrical supply and tested the quality measures. We visited the OBG/YN services and talked to the nurses. We saw a case of Pre-ecclampsia/ecclampsia. The family members did not accept the diagnosis or concur with the treatment. They claimed that it was a case beyond the doctors' capabilities. They wanted to take the patient home and consult with the local voodoo priest. Heavy persuasion had to be used for them to accept our management. We gave a lot of medications to the hospital pharmacy. We returned to Port-au-Prince on Thursday night after a visit to the emptied Hospital of Aquin. However, crisscrossing the department of Grand Anse, we saw many problems or issues to be tackled by the government specially the department of Public Health. Besides cases of malnutrition observed at the Jeremie Hospital, an increase of Malaria cases was observed from December 2016 to the end of February2017. Public Health services have to be alerted to address very quickly the Malaria surge, so many cases of CHF after pregnancy. Talking to the people living in the surrounding area of Jeremie, looking at the fallen trees and the standing ones trees without leaves. It is imperative that the government and the non-government entities bring a much-needed assistance to this horrific situation. The Hurricane struck the area of Grand Anse on October 4, 2016 and 5 months later we are witnessing a very impoverished sector of the Haitian population showing signs hopelessness and helplessness, let say on the brink of disaster. In conclusion, we want to thank all the members of the group who have taken time out of their busy schedule to participate in this endeavor. We also would like to thank the CEO of Interfaith Medical Center Mrs. LaRay Brown for contributing to the success of this program by providing supply of medicines. While we are drafting this report, another group of Haitian doctors under the leadership of Dr. Jacques Guillaume also from Interfaith Medical Center, reached Jeremie Sunday the 19th of March 2017.They are working at the St Antoine Hospital in Jeremie. They are providing help in Pediatrics, Ob-Gyn, and mental health. As Physicians we went to see (veni, vidi…) but we have to recoomment a therapy. Let’s continue to assist and support the devastated South Peninsula of Haiti and the Grand Anse region by accessing our website: www.amhefoundation.org . Until now, given the destitution and local needs, priority should given to the humanitarian aid with donation of supplies, food, means to replace the missing roofs, replenish livestock and resume farming. Yes it commendable to go and provide medical services but the price of medical missions could be better served if directed toward provision of goods. Our donations could even pay for services of some local health professionals actually unemployed. Hope resides in the smile of this child and mother. AMHE Post-Graduate Education for US training in Internal Medicine, Pediatrics Anesthesiology and Surgery has restarted after the successful fund raising activity of December 2014. 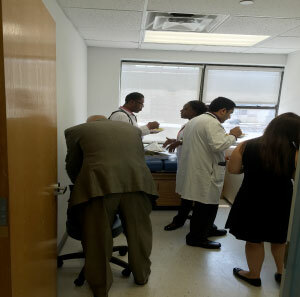 The Haitian Residents spent time at Brooklyn Hospital under the supervision of Dr. Patrick Leblanc rotated in Hematology with E. Guevara, Radiology with S.Buchbinder and then came to Interfaith Medical Center. IMC Teaching attending include, L Shein, D. Shrivastava. E Jerome . A.Dufresne. B Laurent, F Schmidt and G Etienne, for Nephrology, Cardiology, Neurology, Pulmonary and Anesthesiology. The residents also have weekly presentations with Nacier, Leblanc. They attended E Jerome lectures at Kingsbrook Jewish Hospital. They were able to interact with other American colleagues also in training. As outlined in the program, after 3 month rotation, Residents do return to Haiti either in Port-au-Prince or Cap Haitien . Since, they are chosen at the second year level ,they have enough time as trainees to become trainers and increase intellectual capacity of the residency program at HUEH or Justinien. From the start of AMHE program in 2007 to now: 62 Residents have participated in this activity launched by Simact and administered by the Relief Mission of the AMHE Foundation. We are actively looking for support to maintain this undertaking and help Haiti. The funds collected allow us to level the plainfield and give everyone chosen, based on her or his academical achievement the chance to participate. We just learned the sad news of the passing of Dr. Oswald Olivier, who for a long time was an active member of the Chicago Chapter. Dr. Olivier was known for his charm, warmth and sense of humor as well as for his culinary skills and the time he spent caring for Haitian refugees. We present our sincere condolences and warmest sympathy to his daughter, Dr. Mildred Olivier and her family. Visitation will take place from 8:30 am until time of prayers at 10:15 am Saturday 14 February 2015 at the Glueckert Funeral Home, LTD, 1520 N. Arlington Heights Rd (4 blocks south of Palatine Rd) in Arlington Heights. Funeral mass will take place at Our Lady of the Wayside Church, 440 S. Mitchell, Arlington Heights at 11:00 am by Mgr. Willy Romélus. Entombment will take place at St. Michael the Archangel Cemetery. 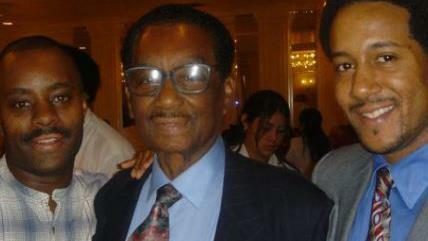 The Olivier family requests, in lieu of flowers, that donations be made to "www.amhefoundation.org". "HEALTH DISPARITIES IN AFRICAN AMERICANS AND MINORITIES IN THE US"
The United States surpass all industrialized countries in health care expenditures. Yet it has some of the worse health indicators among the top 20 countries and some of the greatest diseases disparities. New York Methodist Hospital designates this live activity for a maximum of 3.5 AMA PRA Category 1 Credit (s) ™. Physicians should claim only the credit commensurate with the extent of their participation in the activity. The Medical Society of The State of New York relies upon planners and faculty participants in its CME activities to provide educational information that is objective and free of bias. In this spirit and in accordance with the guidelines of MSSNY and the ACCME, all speakers and planners for CME activities must disclose any relevant financial relationships with commercial interests whose products, devices or services may be discussed in the content of CME activity, that might be perceived as a real or apparent conflict of interest. Any discussion of investigational or unlabeled uses of a product will be identified. No commercial funding has been accepted for the activity. Vladimir Berthaud, M.D., M.P.H., F.A.C.P. •	Thou shalt not define, design, nor commit community research without consulting with the community! •	As ye value outcomes, so shall ye value processes! •	When faced with a choice between community objectives and the satisfaction of intellectual curiosity, thou shalt hold community objectives to be the higher good! •	Thou shalt not covet thy community's data! •	Thou shalt not commit analysis of community data without community input! •	Thou shalt not bear false witness to, or about members of the community! •	Thou shalt not release community research findings before the community is consulted (premature exposition)! •	Thou shalt train and hire community people to perform community research functions! •	Thou shalt not violate confidentiality! •	Thou shalt freely confess thyself to be biased and thine hypotheses and methodologies so likewise! Leland Brown, as quoted in Bor D, Chambers L, Dessau L, Larson T, Wold C, eds: Community Health Improvement: Through Information and Action. San Francisco, CA; Health of the Public Program (supported by The Pew Charitable Trusts and The Robert Wood Johnson Foundation, in collaboration with The Rockefeller Foundation), 1995, pages 11-12. 102-05 Ditmars Boulevard, East Elmhurst, NY 11369. Dr. Nadim Solomon, ID, Beth Israel Hospital. AMHE sponsors a cultural competency training tool for mental health practitioners who service Haitian immigrants and Haitian American patients in Brooklyn and Queens, New York. Through this project, the AMHE (the Association) will develop and implement a cultural competency training curriculum for mental health professionals who come into contact with the population of Haitian descent living in Brooklyn and Queens, New York. The project will provide a valuable tool that can be used for the training of care givers in other healthcare fields. 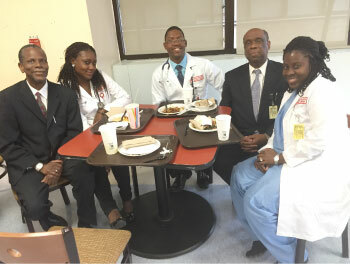 Visiting Professor Program — AMHE Foundation sponsors regular visits by groups of Haitian-American physicians to Haiti and the Dominican Republic to provide free care to the poor, to lecture and conduct technical workshops for physicians and students at the Medical School of the University of Haiti. These teams comprised of generalists, pediatricians, internists, hematologists, gastroenterologists, urologists and general surgeons. In 2007-2008, over 4000 patients were treated for a wide range of conditions, including malnutrition, anemia, hypertension, epilepsy, low back pain, AIDS and other sexually transmitted diseases, pelvic inflammatory diseases, and skin disorders..
La Maison des Etudiants (The Student Center) — AMHE Foundation helped in the construction of the Student Center at the State University of Haiti and, over the years, contributed continuously to its day-to-day functioning. The Center represents a unique amenity in a country that offers little if any support to its less-fortunate or, for that matter, to its institutions. It is a proud achievement and a model that ought to be nurtured. Your support will mean a brighter future for Haiti. Our programs and services can only reach their full potential through the generous support of our partners and donors.